If you’re lucky enough to live near a Chinatown, I’m sure you’ve seen it. Through the windows of Chinese barbecue shops, golden and crimson slabs of meat and whole duck, lacquered in a shiny sticky glaze, hang from hooks that tempt passersby. There’s char siu, whole roasted ducks, soy sauce chicken, five-spiced roast pork with the crunchiest skin imaginable. The food served at these take-out meat counters are known as siu mei 燒味, and they’re served over rice, noodles, or wonton soup as the go-to lunch of choice for the Cantonese. Naively, I never knew char siu was such a huge thing to Chinese food culture—probably because of my own relative meh-ness about it. At many stateside Chinese barbecue shops, I’ve found char siu to be too dry, too leathery and lean, boring to be honest, with a suspiciously pink hue. In truth, left to my own devices, I’d skip it. But as my husband and in-laws keep telling me, it’s because I’ve never truly experienced a superlative version. After hearing my father-in-law describe his recipe, I offered to try it myself. Fair warning: This recipe is not intended to be a casual, quick-dinner option assembled from what’s available in your pantry. This is real deal char siu, using obscure Chinese ingredients that you’ll buy once and may possibly use only once, from grocers where the shop owner may not understand you (fret not, we’ll run the Chinese name of ingredients alongside). But it is a faithful recipe, exactly as siu mei masters in Hong Kong would employ at their roasteries. 1) Jarred fermented brown bean sauce, not to be confused with a number of other bean sauces in the Chinese cooking canon. What’s more confusing is it’s typically marked on bottles as simply “bean sauce.” The only assurance you’re getting the right kind is if it’s marked 原晒豉. Koon Chun is the most popular brand, and available at most Chinese grocers. 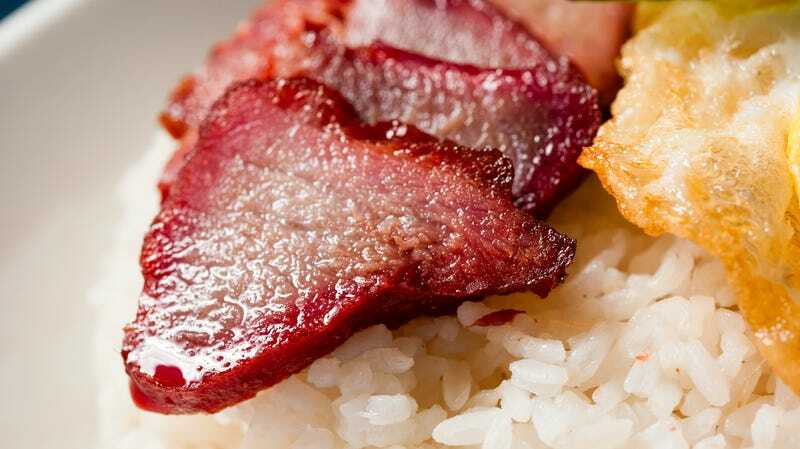 2) Red fermented bean curd cubes (南乳) are often used in long braised dishes, such as pork belly and spareribs. They’re tangy, salty, and extremely pungent—think marinated Chinese Roquefort. Elsewhere in China, notably Shanghai, these cubes are consumed on their own as pungent funky snacks. If you can’t find the jarred cubes, you may substitute fermented bean curd paste. 3) Rose cooking wine (玫瑰露酒) is distilled from sorghum and infused with the flavor of rose. A decent bottle will run around $25—and you can treat this spirit as you would vodka. It’s soft, heady, almost jasmine-like. Its flavor is a whisper in the final dish, but its inclusion is a nod to its significance in Chinese barbecue culture. 4) Maltose is a very thick sugar that’s the reason Peking duck looks super shiny. You can substitute honey, but it’ll add a slight floral note to the more neutrally flavored maltose. All the jarred items should be refrigerated after opening, and will keep practically forever in your fridge. In order to achieve the red tint in the char siu, the natural and authentic way is to soak sappan (East Indian red wood) chips in water to release their crimson dye, which you then incorporate into your marinade. Sappan is available at well-stocked Chinese herbalist shop. Or... you could use red food coloring, like I did. Why red? Chinese people equate red with good fortune, my in-laws told me. While my in-laws would have preferred I construct some hanging metal skewer mechanism in my oven so the vertical pork shoulder chunks baste themselves with maltose glaze (“char siu” literally translates to skewer-roast), our oven—and likely yours, unless you’re filthy rich—doesn’t have the capacity for vertical roasting. So instead, our compromise is a baking rack to elevate the pork—even though it will leave indentations on the bottom of the pork which no self-respecting barbecue shop would tolerate. I, however, did not mind them. Char siu has many delicious applications. Hack it into Wrigley gum pack-sized hunks and enjoy as is. Eat it with white rice with accompanying ginger-scallion sauce. Throw it atop noodles. Stir fry with rice, scallions, eggs, and quick-cooking vegetables to make Cantonese fried rice. Serve warm or cold, with hot mustard or hoisin. It’s all good. In a large bowl, mix all marinade ingredients together (except maltose/honey), breaking up fermented bean curd cube, and stir to a smooth consistency. Mix red food coloring with a little water to make a bright red tint. Stir into marinade. Take the pork chunks and poke all over with a fork so marinade can soak in. Add pork and all marinade into a zip top bag, massage thoroughly, and let marinate in the fridge overnight. When ready to cook the pork, heat oven to 425 degrees Fahrenheit, and place pork on a rimmed baking sheet on an elevated rack. Bake for 20 minutes, flip pieces over and glaze with the maltose or honey and bake for an additional five minutes. Flip pieces again, glaze the other side with maltose or honey and again bake for five minutes. If the pork pieces do not look glossy and golden brown, turn the broiler on and broil briefly. Remove pork pieces to a cutting board, and brush with any juices and glaze that has accumulated on the bottom of the pan, avoiding any burned bits. When cool enough to touch, slice pork pieces into 1/4-inch thick slices.